Home ♦ Coffee ♦ Coffee made with pistachios? I’ve seen pistachio flavored coffee on the menu before (wouldn’t recommend it unless you LOVE spumoni ice cream), but I’ve never heard of coffee that is made with pistachio nuts instead of coffee beans. Recent research conducted by chemists at the University of York indicates that this just might be possible – and that there are quite a few reasons why coffee drinkers, as well as coffee companies, might want to take note. The nut in question is variety that grows on the Pistacia terebinthus tree. It is smaller than the pistachios that you would find in a bag of mixed nuts, and it has the same chemical “signature” as coffee. In other words, when the nuts were roasted to the same types of high temperatures that coffee beans are roasted to, they took on a very coffee-like aroma and flavor. The “coffee” made with pistachios has no caffeine, although it can be brewed up just like the real thing, making it seem like it might be a fantastic fit for those who want coffee without the kick and would otherwise opt for decaf on a regular basis. Even better, the nuts are much cheaper to buy and produce than coffee beans are, so pistachio could be a very cost-effective business to get into, as well. 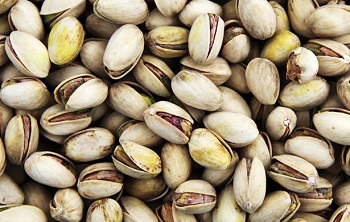 With these small issues taken into account, researchers are trying to perfect the roasting process to remove excess oil and make the pistachios perform more like coffee beans. The hope to keep their unique flavor but improve their performance. Coffee prices are still increasing and for some manufactures an affordable alternative could have a lot of appeal.